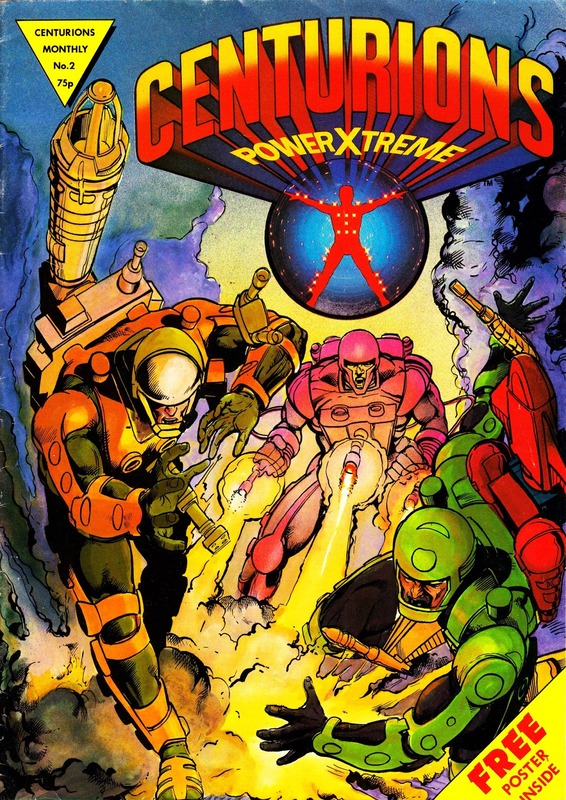 STARLOGGED - GEEK MEDIA AGAIN: 1987: CENTURIONS ISSUE 2: POWER X-TREME! From 1987: the second issue of CENTURIONS, a British monthly based on the toy line and animated series. This was a mix of UK-originated (although possibly drawn overseas) material and reprints of the US DC Comics strips. The show itself aired as part of ITV's summer Saturday morning series GET FRESH, a touring collaboration between (mostly) the smaller ITV broadcasters. This is one of a number of London Editions licensed titles of the time that seems to have been all but forgotten about today. Copies seldom seem to pop up on my travels. They also published MY LITTLE PONY, HE-MAN/ MASTERS OF THE UNIVERSE, JEM, SHE-RA: PRINCESS OF POWER and probably others that I overlooked at the time and forgotten since. I have a hunch that they might have done a BRAVESTAR tie-in and even - possibly - a BATTLE BEASTS comic. The latter started life in Japan as an off-shoot of THE TRANSFORMERS but was given solo status in the West. They also published - of course - succession of titles repackaging DC Comics characters and strips from the States. A long-term project which achieved varied levels of success. I can't say for certain if any of the UK-published Centurions stories were drawn in Spain, but confirmed artists who did strips in the title include Will Simpson (2, 4), Tim Perkins (6, 8, 9, 10) and even John McCrea (9). The reprints of the DC Comics were amusing in that LEM made sure to remove the creator credits, bringing the U.S. stories in line with their policy of no credits for the original U.K. material.